Use these CONCISE worksheets to help prepare your students for end-of-the-year testing or state standardized testing. 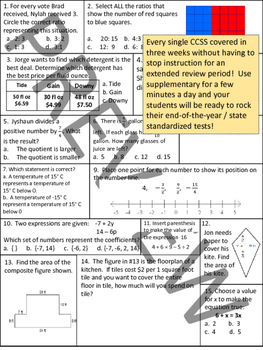 No room for fancy clip art this time, every square centimeter contains great content to help your students succeed! Designed for three weeks of review WHILE continuing to teach new material. We need every minute! No more having to stop and dedicate days or weeks to review. You can continue teaching new material until the end! 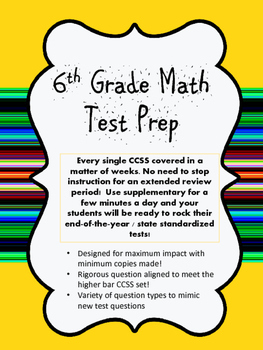 6 pages of review that include EVERY Common Core math standard! Check out the preview to get a better idea of the formatting. Happy teaching!